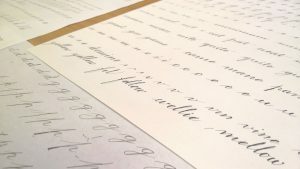 ‘After studying Mechanical Engineering, I began teaching myself Spencerian and Round Hand after coming across the IAMPETH website around 5 years ago. At first it was a real challenge to learn how to use the pointed pen and to familiarize myself with the movements and pen, ink and paper combinations. I have now developed a new modern style inspired by nature and the cosmos, based on the historical Spencerian and Round Hand scripts into an (hopefully) exciting new pointed pen “look”. James gave a comprehensive handout at the beginning of the session and briefly explained development of the hand from English Roundhand to Italic Cursive and Circumflessa developed by Italian Scribes. It was then simplified by American Scribes to become Engrosser’s Script, which was mainly used for formal script, and diplomas and it developed into the Spencerian hand which was used widely in American handwriting. 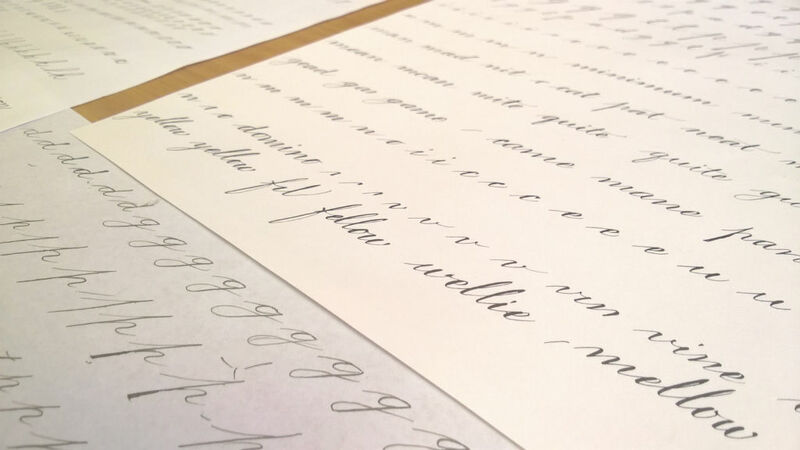 James explained how his Spencerian Script is an exciting and contemporary development of the letterforms, influenced by his interests in Cosmology, Astrophysics and the polyrhythms heard in ‘Jungle’ metal and dance music, using whole arm movement and rhythm. He frequently holds workshops in Italy and America. We used oblique penholders, adjustable metal flange preferred, but the ordinary plastic variety was used by most of us and a variety of flexible pointed pen nibs. Iron Gall ink was thought to be the best but Walnut Ink or good flowing black ink is suitable. Our first exercise was to draw oval shapes in the air using a whole arm movement to develop muscle memory, and then to draw the ovals lightly using pencil onto the paper, drawing ovals on top of each other in a continuous movement. We then progressed to moving the ovals along slightly sideways and then to move the direction of the ovals. We progressed to drawing the ovals with pen and ink. This method develops lightness of touch, freedom of movement and muscle memory. James then demonstrated the individual strokes used to form each letter and letter group and progressed with demonstrations to show, ascender and descender flourishes, angle of slant, and where and how to add pressure. After practicing the individual letter shapes and groups we started to join the letters together to form words. Throughout the session James frequently demonstrated wonderful examples of his exquisite lettering. It looked as if his pen hardly touched the paper but his lettering was so delicate, all the thick and thin strokes were there together with wonderful flourishes and shading. We concentrated mainly on lower case letters in this session, upper case will be for another visit. James explained and showed us examples of his contemporary work using colour, shape, ink blots and splatters. The workshop was taxing for most of us but James was charming and there was lots of laughter, it was a joy to watch him work and demonstrate. We finished off the session with a group photograph taken outside the hall.